The world-famous Mariachi Vargas de Tecalitlan know San Antonio quite well. 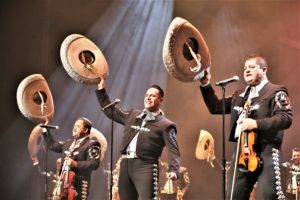 They have been the main attraction at the annual Mariachi Vargas Extravaganza since 1995, when the local PR firm, Munoz Public Relations, started organizing a festival showcasing the exuberant and joyful mariachi music. And they are here right now. The 2018 fest started last Sunday with a mariachi mass at Mission San Jose and concludes Sunday. Nov. 18, with a grand concert featuring the 14-member ensemble led by Carlos Martinez as music director. If you like mariachi music, you won’t want to miss it. It’s scheduled for 7:30 p.m. at the Lila Cockrell Theater. Founded in 1898 in the town of Tecalitlan in Jalisco, the Mariachi Vargas ensemble has been defining the mariachi style for six generations through performing excellence, innovation and teaching. It often collaborates with other music organizations such as the Houston Grand Opera, Orquestra Filarmonica de Jalisco and Seville-based Orfeon Donostiarra. The group is currently touring with pop super star Luis Miguel. The festival attracts more than 1,000 participants from all over the U.S. and includes vocal, instrumental and song writing competitions, workshops, jam sessions and the free outdoor event Serenata en el Rio, a concert in the River Center lagoon that features dozens of participating mariachi groups. Tickets for the Sunday concert can be purchased at Ticketmaster outlets, Ticketmaster.com and at the Alamodome Box Office. You can also call 1-800-745-3000. Founded by Cynthia Munoz, Munoz Public Relations is “dedicated to promoting and producing upscale, quality mariachi performances that embody the beauty and tradition” od the genre. Other Munoz-produced events include Serenata para las Madres Mother’s Day Celebration and the annual Mariachi Extravaganza Summer Camp. For more info contact 210-225-3353.